According to my tags and categories, my most popular posts according to WordPress still relate to Australian literature, Women writers, Australian writers, 21st century literature and Review-Novels. However, as in 2013, my most “hit” post* for 2014 was a short story by an English woman, Virginia Woolf’s “The mark on the wall“ (reviewed in March 2012), presumably because it’s a set text for schools/universities. Australian novel (second highest hit overall): Merlinda Bobis’ Fish-hair woman (reviewed in April 2013). Interestingly, a large percentage of the hits came, I believe, from the Philippines – in the second half of the year. Was it set for study? Was it only just published there? Will it retain this position in 2015? Australian short story (fifth highest hit): Barbara Baynton’s “The chosen vessel” (reviewed in November 2012). It was my top Australian hit last year. I’m guessing that, like the Woolf, it’s a set text. Non-Australian novel (sixth highest hit): Pramoedya Ananta Toer’s This earth of mankind (reviewed in June 2009, about five weeks after I started blogging). The interesting thing is that my top ten reviews are heavily slanted to older novels and short stories. Is this because newer works are widely reviewed across the web resulting in searches first reaching prime sites like newspaper reviews, whereas older works are covered more sporadically so that searches are more likely find them on blogs like mine? Regardless, for me one of the joys of blogging is giving life to older works on the web. I’m also aware that many of my top hits are for older posts, which suggests that there’s some longterm value in this here litblogging! Then again, perhaps I’m drawing some long bows from minimal data! When I started Monday Musings in August 2010, I’d been blogging for 15 months. I had no idea that I’d still be blogging over four years later, let along still writing Monday Musings, but here I am … I have, I believe, written 224 Monday Musings posts. At times I have wondered what on earth am I going to write about this week, but I’ve discovered that I enjoy the challenge of finding a new angle or a new piece of news or a new theme to explore. One of the reasons I enjoy it is because of all of you who read and comment on them. I love the conversations that often result – and have learnt much from the sharing that has happened. So, thank you for joining in with such enthusiasm and good grace. Now, what shall I write about tomorrow? describe wolf hall in 20 words: good luck with that. I wonder if my post helped! poem for boys in love and gun: hmm … two of my posts mention poetry and guns so I suppose that’s what the seeker found, but whether s/he found what s/he was looking for I have no idea. australian landscapes nice and simple: well, of course, I mention landscape a lot on my blog but I’d love to know what this person was looking for. A travel blog? An art blog? pickingjob lengly night: no idea what this means but I’m guessing it brought the seeker to my review of Eve Langley’s The pea-pickers. i got the wooden spoon my pants pulled down: whatthe? I think this reached my Delicious descriptions from Carrie Tiffany post. smacking wooden spoon Facebook irish: see above! Of course, I plan to continue to participate in the Australian Women Writers’ Challenge this year, so let this be my announcement post. We are asked to choose a level or create our own. I plan to stick to the top level, “Franklin, read 10, review 6”. I always exceed it, but I don’t plan to challenge myself to read more than I did last year. 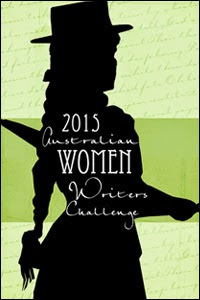 As I’ve said before, my doing this challenge is a “cheat” because Australian women writers have been my particular interest since the 1980s. If I wanted to undertake a “real” challenge it would be to increase my reading of non-English language writers, but, as I don’t do challenges, I’ll leave that alone! Thanks to everyone who read, commented on and/or “liked” my blog in 2014. I really do appreciate your visiting me here. I wish you all happy reading in 2015. * The ranking I’m giving excludes the top hit by far which is “Home page/Archives”. I don’t think that counts really. Yes, I agree, Stu. I love to see the searches. One of my top searches was ‘where to find hookers in ___’ (a couple of different towns). It’s all those pulp noir books you read Guy. You’ll be getting reputation. Thanks for all the interesting posts from 2014 and such good stuff about the history of Australian literature. Thanks Ian … you’ve no idea how much I’ve enjoyed and appreciated your interest and contributions from the other side of the world. Thank you. “i got the wooden spoon my pants pulled down” !!! LOL! I love seeing google search terms and would love to know what that person was looking for. I hope you have a wonderful 2015! Thanks Jackie … Yes, though I’m not sure I REALLY want to know!! All the best to you for 2015 too. “i got the wooden spoon my pants pulled down” is cracking me up. What kind of blog are you running here anyway? 😉 A very good year for you. And I hope 2015 is off to a great start! My secret is finally out! Thanks Stefanie … And of course to you too.